People often ask me how they can get their question mark back. The first time or two, I didn’t know what they meant. 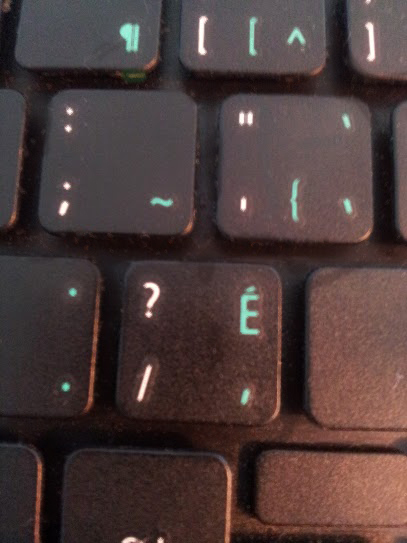 But now, so many people have asked, I know they mean that every time they try to type a question mark they are getting an é instead. They don`t know how to get the question mark back. All you have to do is hit Ctrl and Shift. Hold the Ctrl key down first, then the Shift, keeping them both down at the same time. Sometimes you have to do this twice or hold the two keys for several seconds. You should be back at your normal keyboard. For other tech tips or help consider Ducktoes Computer Services. I’ve had this problem too, on more than one computer. It’s not only the question mark but many of the other special charachters. It seems it only happens when I have used up a lot of resources. Then I have to reboot. It’s a big windows annoyance, and happens at least once a week, and usually more. I’ve not seen what you’re talking about Mike. Interesting. I’d like to see it. I wonder what is going on with your computer.